Pack your bags and load up the minivan for more fun, more laughs and more hilariously “wimpy” mischief! In Diary of a Wimpy Kid: The Long Haul, the Heffley family road trip to Meemaw’s 90thbirthday celebration takes a wild detour thanks to Greg’s newest scheme to attend a video gaming convention. Based on one of the best-selling book series of all time, this crazy, cross-county adventure turns into an experience the Heffleys will never forget! Download Diary of a Wimpy Kid: The Long Haul in Digital HD from the iTunes store. Diary of a Wimpy Kid: The Long Haul images are © 20th Century Fox. All Rights Reserved. 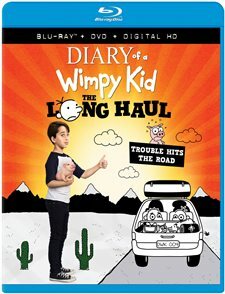 Diary of a Wimpy Kid: The Long Haul is the most recent movie in the Diary of a Wimpy Kid franchise, based off of the series by author, writer, and producer, Jeff Kinney. Cute and entertaining for the kids when you need to occupy them, this is a lighthearted and family friendly comedy that –while over exaggerating a teen's boys' thoughts and processes, really isn't that far off from what these kids today must be thinking. The Long Haul takes place- time wise-relatively soon after the last movie takes place but because of the five years in between release, Director David Bowers (Flushed Away) made a calculated decision to re-cast the film, as the original cast probably grew up too much in those long years. Keeping the cast closer to the age of the character is a plus for this movie, although the main character isn't quite the same as the first two movies, and for some diehard franchise kids, it was just not the same. 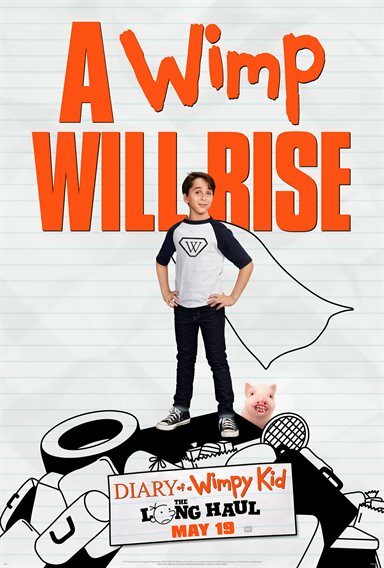 Nonetheless, Jason Drucker (Every Witch Way) does a good job stepping into the role of Greg Heffley, which was already created by a prior actor. In The Long Haul, Greg is on his way, via car, with his family to celebrate his Meemaw's 90th birthday. Yes- a family road trip- is where all the magic happens in this movie, which is a little bit of relief from the school setting. When Mrs. Heffley (Alicia Silverstone; Who Gets the Dog?) determines that this will be an electronic free trip and demands all electronics be turned into her possession for the duration, Greg flips because he was hoping to be able to go to a video gaming convention on the way to grandmas. Of course, knowing Greg, he will find every possible avenue to get himself to that convention. The video presentation is provided with a resolution 1080p HD; Codec MPEG-4 AVC, and an aspect ratio of 2.39:1. Despite the lackluster storyline, the picture quality is surprisingly good. A clear and crisp picture, along with a happy brightness supports the settings. The outdoor scenes all have a natural light to them, which is definitely one of the better qualities of this film. We cannot forget to mention the stick figure drawings that are Kinney's illustrations, which are present in the Diary of a Wimpy Kid Franchise, representing thoughts that pop into Greg's head. These do provide a different approach to the franchise rather than inference as another movie may provide to the audience. Audio is presented in DTS-HD Master Audio 7.1. Following in the footsteps of its sister video, the audio is clear and dialogue can be heard over background noises without strain, which is wonderful as the movie is fraught with appropriate background noises. The Master Audio is a good choice for the audio in this film, as it provides enough depth without overpowering the dialogue as other choices may have done. Making a Scene- Three featurettes showing the shooting of several sequences. Road Games: Additional clips to enjoy. Learn to Draw: Pay attention while Kinney provides lessons to any future Illustrator watching. Gallery: See photos both as the screen flips or set it to a manual advance so you can control the timing. The Digital Version also provides an added bonus- the full-length movie of the original Diary of a Wimpy Kid movie. Diary of a Wimpy Kid: The Long Haul is a cute movie, with a new cast, that flows the way the prior two movies in the franchise did. Aimed at the younger school age, it is a resourceful movie but the adults may crave a deeper philosophy than presented. Regardless, it's a clean comedy that works well for the younger audience without being an animated movie. It certainly will give the kids some good ideas for when they are teens!